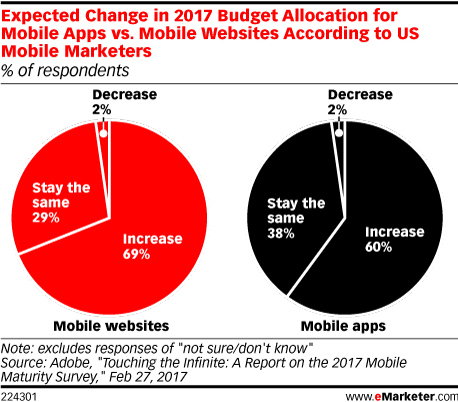 Data is from the February 2017 Adobe report titled "Touching the Infinite: A Report on the 2017 Mobile Maturity Survey." 254 marketing decision-makers and 50 IT decision-makers in the US were surveyed online in October 2016. 58% of respondents work directly for an organization, 42% work for an agency on behalf of clients. All respondents had experience with mobile marketing/development at their organization, perform mobile marketing activities regularly and either recommend or request mobile marketing/development tools. Respondents' organization or largest client has 500+ employees. Respondents were not required to use Adobe products.